This should be *very* simple for someone that knows what they are doing. I currently have something started in pygtk that has roughly the look I want. Problem is I have never programmed in Python and haven't done much with GTK either so I am a complete novice at what I am attempting to do. Ok, first off let me tell you what I am trying to do. 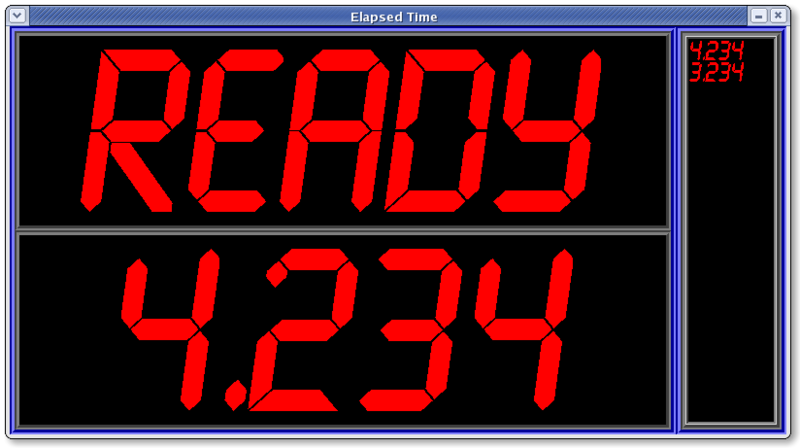 I have this large LED display (5 inch high numbers) that we are using to record elapsed time with starting line and finish line sensors. When I get my cable I will be able to capture these times off of the serial port (Chronomix format). I eventually want to write a database app that will record these times automatically into the appropriate record but for now I just want to get something extremely basic set up. Notice the times are just hard coded. What I would like is the equivalent of a "tail -f filename" inside the program and as numbers are read the display is updated. Latest time on top pushing the older times down. I haven't been able to figure out how to set up a loop that will wait on input and then update the times when input is received. The font isn't needed to make the program work though. Sorry I know perl much better then python. Thanks. I thought about using PerlTk but was hoping to use this exercise to learn something about Python and a little more about GTK. I've tried to sit down and learn Python in the past but it's just so much different that I don't know if I really WANT to learn it. I am certainly much better with Perl and I have even written a few PerlTk apps in the past but I do very very little GUI programming. Having said that I am rusty at best with the Tk part of it. In the PyGTK program I used a text buffer with scrollbars rather than a label. My thought was I could just keep inserting text and be able to look back on previous times by scrolling down, not that the times by themselves would mean anything beyond 2 or 3 from the latest. In your example when the times update the window disappears and then reappears. I wonder if there is a way to smoothly scroll the text down without the window disappearing? I'll play with your PerlTk start and see what I can come up with. I know I'll make better headway than I will with Python because I am already proficient with Perl which will make things go a lot faster on the database backend. P.S. I also notice that in PerlTk the edges on the LCD font I am using aren't nearly as smooth as they are in PyGTK. I am using pango in PyGTK. I wonder if there are any Tk options to make the font look nicer? This is the font param I am using now: "-font=>['lcd', 150, 'bold']"
What is this for, anyway? You trying to set something up for a race? Like a Pinewood Derby? Helping the kids? Ahh ok. I thought you only wanted to see the last three or so. You can use the Scrolled along with the ROText flag to get the results you desire. Since you wanted to see the last results at the top then some tricky read and delete then reverse and readd methods had to be used but it works. worker201 wrote: What is this for, anyway? You trying to set something up for a race? Like a Pinewood Derby? Helping the kids? We bought the 6532E setup. We have an older light set that I am getting nervous about failing so we'll use it as a backup since we have the new one. I used to enter all the times manually into an OpenOffice Calc spreadsheet for each rider (around 100 riders times 2 climbs each (and some riders enter in multiple classes)). It keeps me busy without a break for about 6 hours straight. Anything I can do to automate this will be great. I figure with the new light we can mount it outside of the timer shack and we wouldn't necessarily have to be able to see it if I have a laptop hooked up to it also displaying the times in the shack. Our next climb is less than a month away so I probably wont have the super elaborate rider database done by then but I figure I can at least have a laptop also displaying the time and keeping the last few up in case the timer gets reset and we missed recording it. Fun fun fun. ZiaTioN wrote: Since you wanted to see the last results at the top then some tricky read and delete then reverse and readd methods had to be used but it works. So when it's in that state I would like to have the top box display it just the same but the second box would contain the previous time. 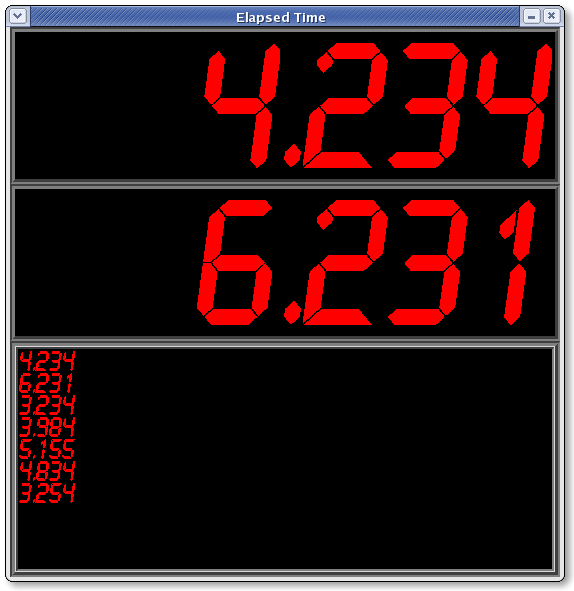 Now, as new times are recorded the time from the second box is pushed down into a scrolling area of times below both of those boxes, with a smaller font. 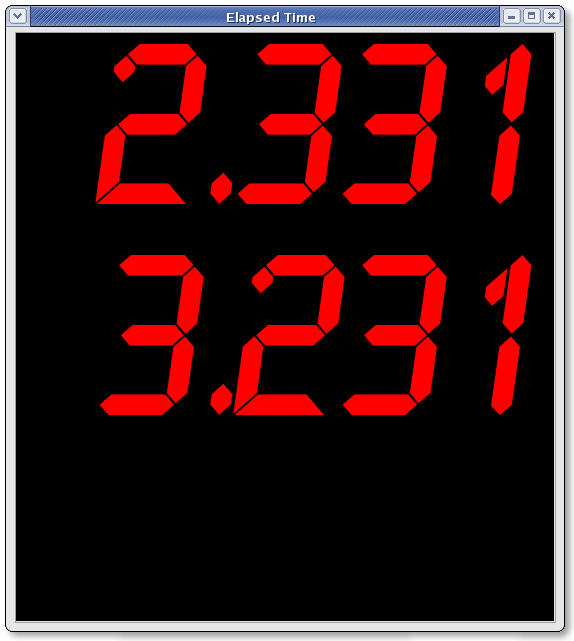 Also, the clock has a fixed format of course, in the format of "SSS.FFF" so there will always be 3 digits on the right side of the decimal which is why I want it right justified and need a fixed font. Everything lines up and looks much better that way. The times will almost always be below 10 seconds for our application. Fastest times are usually just over 3 seconds and slowest times are usually less than 6 seconds. It's probably just as easy to code it as it is to describe it but I probably won't get another chance to work on it until this afternoon, and I like to see what ideas other people have. I'm still not 100% sure how much information I can get off the serial port other than just the times though. I don't know if it sends out a record when it's ready (just showing the decimal). I have to think it would but I won't know until I get my cable in the next couple of days. I have been conversing with someone who has a similar light and is capturing times on a Linux PC for some sort of white water racing. He's going to be timing the white water events for the Pan American games as well. 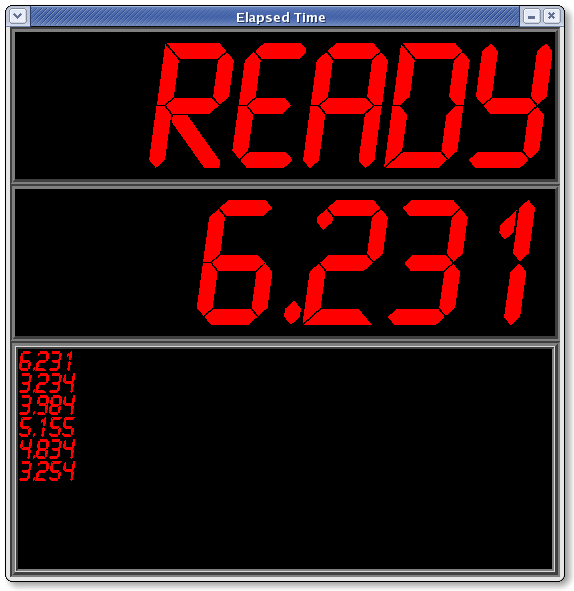 His timer is a little different in that they use it as a running stop watch and grab the times as the lights are broken and update a MySQL database with them. I guess they would get running time as well as elapsed time. But now I've lost my right justification. I changed your code to be a little more stable in appearance. 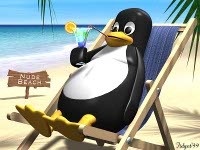 Your code looked different on my Windows machine then it did on your Linux box. I know we don't care about Windows but designing your GUI in a more explicit way is a better option I think. Basically only thing I changed was expanded the widgets and "-filled" them just to make sure they look the same across platforms. Tk on Linux assumes some default things that Tk on Windows does not and expansion and fill are two of them. I also added the section labels like you referenced. Laptop #1: I have an old Dell Latitude CPi 366Mhz laptop that will be running the app we built in this thread. The timing light will be plugged into the serial port on this laptop. It will also be running a MySQL database and an Apache server. I have upgraded it to FC4 and just ordered some more memory and a new battery for it. I also stuck a wireless card in this laptop. Laptop #2: My main laptop also running FC4 and has a wireless card. We have about 4 hours before the event where the riders sign up and pay their entry fee. I will have a web app (PHP) built and running on Laptop 1 that I will connect to from Laptop #2 in the clubhouse and enter all the rider info into the database through that web app. In fact since it is a web database we could have more than one person at a time entering rider data. Before I entered it all by myself in a Calc spreadsheet. During the event when a rider comes to the line I would like to be able to enter the rider number in the ET program we wrote in this thread, which would then pull up the rider info and display it along with the time. When the time is displayed I would like it automatically entered into the database associated with that rider number. Actually, I may need that time to be editable and have to have someone click a button to record it in the database. The reason for this is that the rider might not actually make it over the hill and we will have to record a footage rather than a time (which is the case mostly in the kids classes). In the first climb we had this year I also had a laser printer hooked up and after each run in each class I would print out a sheet sorted by fastest rider and hang it on a bulletin board outside the timing shack. I am thinking that since I will have this on a wireless network we could have someone else bring in their laptop (laptop #3) and have a real time status page that could be browsed. It would save me a lot of printing and time not having to do that. I am not sure if I want anyone entering data on the keyboard on laptop 1 though. I might want to do this from my laptop 2. I think leaving it as a display laptop only (and running the database and web server) is the best way to do it. I will have to enable this Tk app to recognize what rider is at the line and display their information. I guess this means that the Tk app will have to change quite a bit to also display the rider information and maybe record the rider number with the time in the history. I don't really want to worry about that until I get the web database built though. Last night before calling it a night I wrote a little script to stick different times in the "time.dat" file every 1 second alternating with a "." to put it into the READY state. I fired up a second copy of the app and had it display on my second laptop over the wireless connection. So I had two copies of the Tk app running times every 1 second all night long. I just wanted to make sure it would hold up on climb night. It passed with flying colors. The old laptop running it only has 64MB of RAM and is a 366Mhz running FC4 (as I mentioned). I also have it running the ET Tk app, the MySQL database, and web server right now and it seems to be working very acceptably even with that little amount of RAM. I should have 256MB in it by the middle of the week so it will have more than enough to do what I want. I'm open for suggestions on any of this and if anyone is interested in helping I would certainly take it. I certainly thank you for the boost with the perl-Tk! Sometimes I just need a nudge here and there and then I can't stop myself. Sounds like what you want is very possible. I would be happy to help with any of the perl programming you need. I am very familiar with Tk GUI creation, database programming and web scripting. Also socket programming, threaded models, etc, etc, etc... Pretty much anything you can do with perl I am familiar with. Let me know if you run into any specific issues or need any help with any of it. Also remember the "Project Tracker" web application I wrote for you a while back. That would be a good reference for you for your database portion. I actually do Perl and PHP database and web programming all day every day at work which is why I have to motivate myself to do things like this. I just don't feel like doing it at night. I guess the motivation is that it is something for me rather than for someone else. Just kidding, but seriously have you finished it yet?